The central Vietnam Culinary will take you to 2 authentic cooking classes in Hue and Hoi An – 2 famous central of Vietnam Culinary in 5 days. Together with learning and experience the identities of local cuisine, you also have the great opportunities to discover Hoi An – the living Museum and Hue – the last capital of Feudal System in Vietnam. More than this, we also can take you to all the Hidden Charm of destinations for the real experience of local attraction and identities. Flight to Phu Bai airport. Upon arrival, drive to Hue, the ancient capital of Vietnam from 1802 to 1945. Check in your hotel in Hue. Afternoon visit Thien Mu pagoda, the symbol of Hue city then take a walk around Kim Long Village where you can visit the original ancient house of the former mandarin, mingle with local people and experience their daily activities in the village. In the evening, visit Dong Thien Pagoda to enjoy a vegetarian lunch prepared by the nuns. Our visit contributes to the Pagoda’s kindergarten that educates children from needy families. We will interact with the nuns and learn more about the Pagoda before going back to the hotel. 09h00-09h30: Hue Drinking and Eating Art introduction. Food to be practiced introduction. Cooking material preparation. Afternoon, take the visit to the Imperial Citadel and Tu Duc Tomb, discover beautiful and impressive architecture of this unique construction in Hue as well as the story of the King there. In the evening, you will experience the dinner in the local restaurant of all typical kind of Hue cake such as: Banh Beo, Banh Nam and Banh Loc. 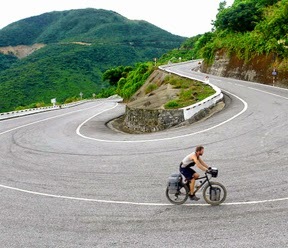 Morning depart to Danang through famous Hai Van Pass. Upon arrival, visit Cham Museum with great collection of sand stone artifact from 4th to 13th century. Arrive in Hoi An, the little attractive town very famous as living museum which was originally one of major trading centers of Southeast Asia in the 16th century. Lunch at Cargo Club Restaurant. Afternoon, take a walking tour to Hoi An ancient town. Visit Phuc Kien congressional assembly hall, Japanese Cover Bridge and Tan Ky ancient house. Then you have free time for discovering the town on your own or shopping. In the evening, you will have a chance to try to most famous and popular local food in Hoi An: Com Ga (Chicken Rice) and Cao Lau. Morning visit to Tra Que herb village near Hoian. This village very famous for growing organic herb for supplying to Hoi An. You will interact with local farmer their and learn about different kind of herb and the way how they grow them. Visit to a local made bread factory before going to Morning Glory restaurant for cooking class with Ms. Vy followed by lunch. You start with a 1 hour market tour to learn about Vietnamese ingredients & how to choose fresh foods. Next is a short talk on the art of Vietnamese gastronomy, vegetables, herbs & spices & how to prepare & use them. Afternoon depart for the cyclo trip to Cam Nam Village (this is exclusive discovery feature of ICT). The cyclo will take you from the town to Cam Nam Bridge. You will have the first stop for the photo opportunity of the activities and scenery on the Thu Bon River. Then the cyclo will take you along the Thu Bon River bank, where you can have another photo stop for panorama view of Hoi An from other side of river. You will ride along the riverside and cycle through local villages of Cam Nam. This is untouched area by tourism with very friendly and hospitable local people. You can see their daily life activities or even viewing the interior of their house and their life through always opened doors. The cyclo trip will be ended at green small canal covered by water coconut trees. Embark on the boat and take a cruise to Thu Bon River. You can experience the local daily life along river, such as fishing, farming, catching clam…. Come back to Hoi An around sunset time. Morning is free at leisure until the departure time to the airport for the flight home.